From the outside, the Living Hope Farm tunnels in Masipumelele, Cape Town, look just like any large vegetable tunnel filled with lush growth. Look inside and you will see texts from the Bible hanging between the tall rows of tomatoes. Next day while standing in a tunnel his dad’s message came back to him. Joey realized that he was effectively in a 30m x 8m church. Unlike an extensive farmland with workers scattered throughout, the tunnel was a concentrated space, where accelerated plant growth was a metaphor for the growth of the people working and learning together. Farming at Living Hope is about teaching people skills so that they can improve their work opportunities and also offering them an environment that encourages spiritual growth. Joey hung the first Bible texts in the tunnels and a few days later Itai one of the students at the time brought him a new set of scriptures saying that these were the ones that were important to them. Local is Lekker and especially when it applies to urban farming which builds food security while providing work and entrepreneurial opportunities for unemployed city dwellers. However, farming requires resources and farmers. Nowadays urban youth don’t regard farming with its physical challenges as a sought after work opportunity. Images of schoolboy herders and of aging parents or grandparents living quietly in the country just don’t compete with the buzz of city life. This did not discourage Rev John Thomas who realised that the best occupation to train people into was agriculture as one does not need extensive marketing skills or networks to sell food. This led to the purchase of two vegetable growing tunnels which could be used to establish a local farming training centre and to expand the Living Hope skills development programme. A small but excited group of students are now learning how to grow and market hydroponic vegetables. Hydroponics rather than organic farming is investment intensive and may not be the best model for small scale start up farmers. Living Hope trainers acknowledge this while explaining that they are rekindling an interest in food production while also teaching basic business management and entrepreneurial skills to unemployed people. The students who graduate will have the skills and confidence to start their own businesses. 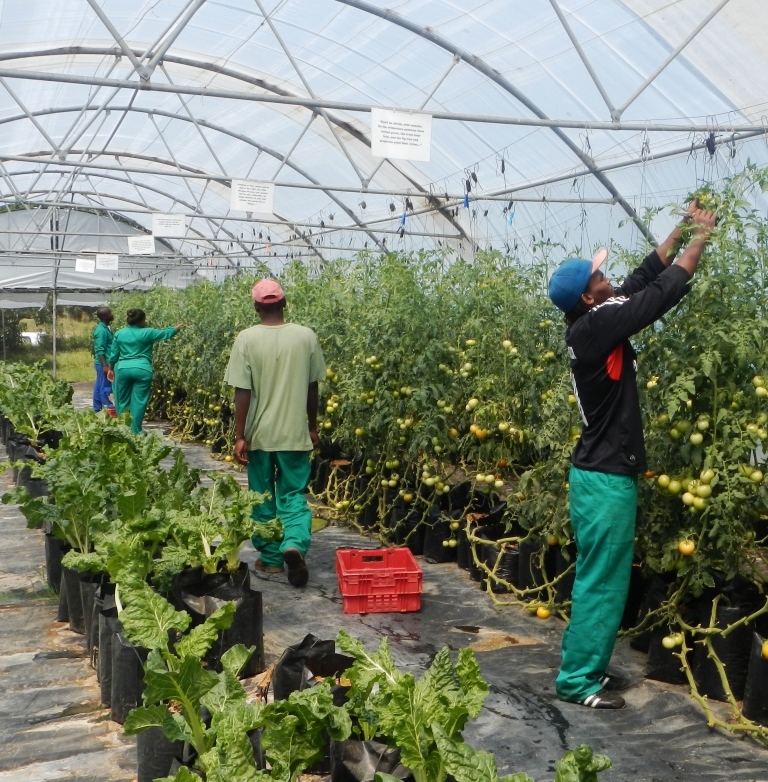 Living Hope Farm now has 13 tunnels and sells tonnes of tomatoes and cucumbers to local retailers under the Living Hope Farm label. The farm also offers vegetables at cost to a number of unemployed people living with AIDs for them to sell to earn a small income. While the sale of the vegetables provides local fresh produce the intention is that the farm should generate income to subsidize the training apprenticeship which is free. It has been a steep learning curve for Living Hope staff many of whom are young volunteers from overseas and especially America. Most are graduates from disciplines other than farming but felt called by God to help make a positive difference in the lives of people who are materially less fortunate. 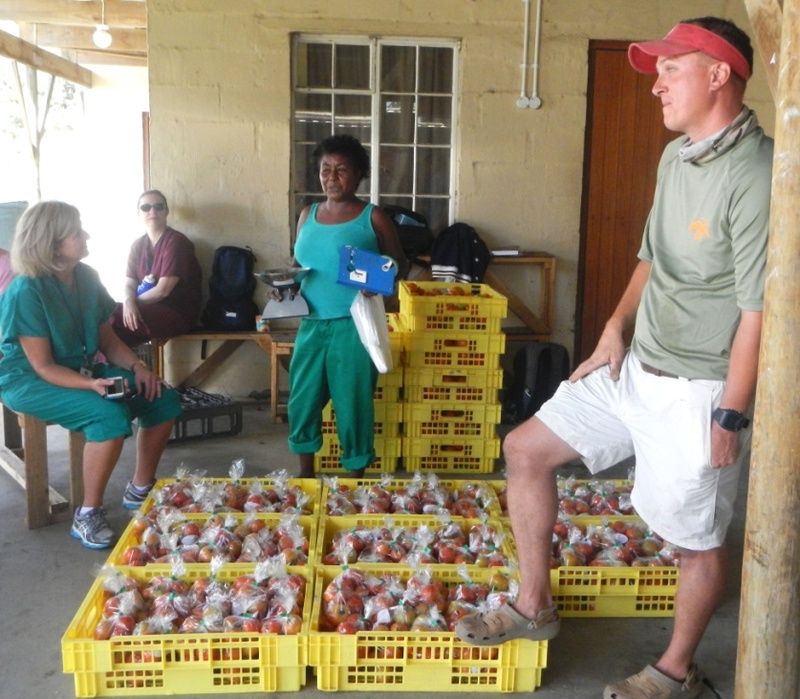 The volunteers and the permanent staff who are from the local community are all supported by Gerrit Kleynhans the farm manager who has over 14 years of experience earned on a mission farm in Malawi. The permanent staff each have a number of students to mentor and are also responsible for the hands on care and harvesting of the plants in their specific tunnels. Patricia and Joey explaining how tomatoes are washed and packed for market to a group of American visitors whose contributions support the outreach work at Living Hope. To date the training programme has skilled and inspired one set of graduates and is busy with its second intake. Of the first graduates, two have returned home to Zimbabwe to established farms, a pig farm and a broiler chicken farm. 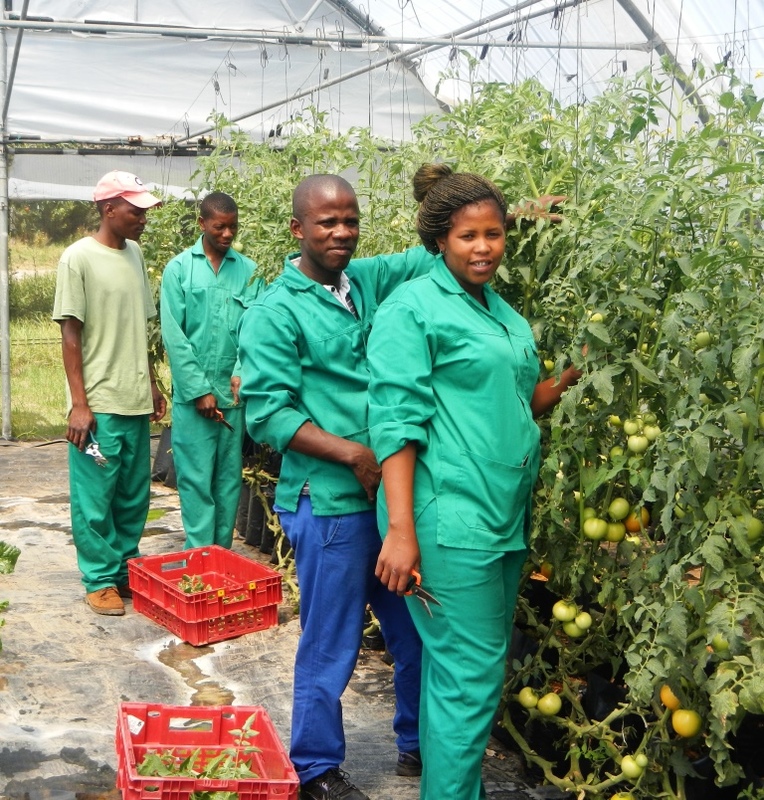 A third graduate is working as a mentor to new trainees at Living Hope Farm, while she and her husband raise money for a borehole on their land in Laingsberg where they plan to grow purple onions. Returning to their home towns to establish sustainable agri businesses rather than being unemployed in the city is one of the desired outcomes of the training. Living Hope Farm recently acquired new land opposite Masiphumelele and is in the process of extending their farming activities and business training programme to include jam and preserve making skills. With local markets in a City always hungry for affordable good food urban farmers could help to kick start a renaissance in farming and reconnect city people with the essentials of food production. Earth Keepers wishes Living Hope Farm well in its endeavours to find local solutions for food production and employment. For more info go to: www.livinghope.co.za.